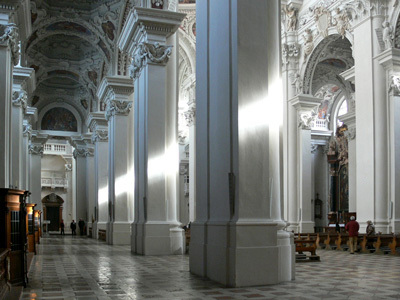 PASSAU — What more heavenly way to mark your 90th birthday than conducting a favorite symphony in four cathedrals on four successive nights, and with an orchestra that adores you? This, at least, was Herbert Blomstedt’s thinking, amenably realized by the Bamberger Symphoniker — in Bamberg’s Dom St Peter und St Georg July 19, Würzburg’s St-Kilians-Dom July 20, Passau’s Dom St Stephan July 21, and, aptly in this case jumping from Bavaria to Austria July 22, the Stiftsbasilika St Florian. On the stands: Bruckner’s Fifth, his Fantastische, a work that climaxes only in conclusion. Blomstedt wore a beatific smile here as he gently yet cohesively propelled the players through the 75- to 80-minute score, applying a number of firm accelerations (to clock in at the fast end of that range). Occasionally he requested less sound, from his chair on his podium on a tube-and-clamp orchestra platform far below Dom St Stephan’s emphatic white moldings and rich Carpoforo Tencalla frescos. Cathedral acoustics had their various effects: here was “staccato with resonance,” in Jochum’s phrase; here, too, pizzicato without exactness, quite a drawback in this symphony. The cohesion lay of course in the counterpoint: not everyone’s strong suit but certainly Blomstedt’s. So the grand musical edifice stood straight and its sections and parts sounded and ended exactly where they needed to. Light shone into the music, much as it streamed through Carlo Lurago’s transom windows. Ideas flowed in long breaths. There was no leaning on particular notes, no pushing for effect by the Bambergers. Blomstedt presented a rational and questioning, ultimately peaceful, encounter with this magnificent score, keeping volume in reserve for its late peroration. Even there, from where the Finale’s two fugues sound together in the brass (after the double fugue) and the horns lastly restate the first-movement theme, no one blasted. Balances had been set, and the American-born maestro could cue without visible effort players he has known for decades, his back to a capacity crowd. The Passau performance took place as part of European Weeks, in another American connection. This was the first festival founded in postwar Germany, in 1952, when the U.S. 7th Army Symphony Orchestra served in the pit for Le nozze di Figaro starring Willi Domgraf-Fassbaender and “We Demand the United States of Europe” served as marketing slogan. The 65th European Weeks was as busy as any before. Home to Europe’s largest cathedral organ, Dom St Stephan splendidly models the Italian Baroque. Along with Lurago and Tencalla, designer Giovanni Battista Carlone produced its dramas of contrast: stucco against frescos, daylight against shadows, plain verticals against the ovalled, vaulted ceiling. Outside, meanwhile, three rivers calmly meet: the charcoal-colored Ilz from the Bavarian Forest, the milky-aqua Inn from St Moritz via Innsbruck, and, in between, the coffee-colored Danube from the Black Forest. (Munich’s Isar and Salzburg’s Salzach are upstream tributaries.) The main stem takes the Danube name although the Inn has been the trunk flow, and the coffee color prevails as it enters Austria two kilometers down. This entry was posted on Saturday, July 29th, 2017 at 6:48 am	and is filed under Munich Times. You can follow any responses to this entry through the RSS 2.0 feed. Both comments and pings are currently closed.